What’s the GOP message on health care, anyway? Since the new year, Republicans have tried out multiple slogans to explain to voters what their health care policy goals are and how they plan to achieve them through the legislative process. But they don’t appear to be sticking. All three phrases have drawn loud criticism and at least one was abandoned altogether early on in the House Republicans’ winding crusade against the Affordable Care Act. Their efforts are expected to culminate in a vote on the House floor as soon as late next week. The messaging challenge is just one of many obstacles Republicans have faced in trying to overhaul the health care system. It also foreshadows problems the party is likely continue to confront as it struggles to win over skeptics — especially if the bill goes over to the Senate. Only 34% of people said they support the House bill, according to a Fox News poll released Wednesday. House Speaker Paul Ryan has acknowledged as much in public. 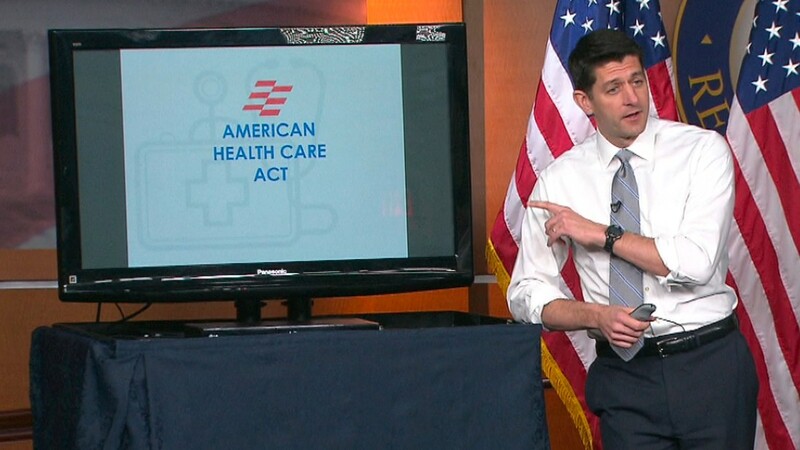 Widely known in Washington and beyond for his wonkish tendencies — he used a PowerPoint presentation last week to explain his health care bill to reporters — Ryan has suggested that selling the House GOP bill will take far more than a catchphrase. And Ryan’s efforts to simplify the complicated process of overhauling Obamacare have sputtered repeatedly. At the beginning of the new Congress, Ryan and others promised that the party would take a “repeal and delay” approach — repeal the law first, but delay the repeal from going into effect while lawmakers figured out how to replace what was rolled back. But that idea was met with widespread concern: Republican lawmakers feared that repealing Obamacare without an alternative in place would be irresponsible as a policy matter, as well as politically dangerous. So “repeal and delay” went away and leadership vowed that “repeal and replace” would happen in one swoop. But that proved complicated, too. These days, both GOP leaders and President Donald Trump are advocating for the “three-bucket” or “three-phase” strategy. It refers to a multi-step process to creating a new health care system: First, the Obamacare repeal bill that is currently moving through the House; then, administrative actions from Health and Human Services Secretary Tom Price to adjust regulations; and then additional legislation that would require 60 senators for approval. Both Labrador and Cotton argue that it would be impossible for Republicans to garner any Democratic support in the Senate on health care legislation to meet the 60-vote threshold. Other buzzwords have turned sour in the mouths of House Republicans: talk of providing better “access” to coverage quickly became loaded, with Democrats arguing that “access” to insurance means little to people who cannot afford it. And perhaps the biggest complication stemmed from the President himself — Trump raised eyebrows when he promised earlier this year that he wants “insurance for everybody,” a significant deviation from the GOP talking point on health care. The Congressional Budget Office also released analysis this week projecting that under the House GOP bill, some 24 million more people would be uninsured than under Obamacare. “How will this plan live up to the President’s promise?” CNN’s Dana Bash asked Price at a CNN town hall Wednesday. Veteran Democratic pollster Geoff Garin said Democrats, too, struggled in finding effective messaging tools during the rollout of the Affordable Care Act, particularly in convincing the public that the changes would not put at risk their own overage. Republicans also pounded Democrats with grave warnings of a “government takeover” and misleading phrases like “death panels” — stoking fears that the Affordable Care Act would allow bureaucrats to determine who would get health insurance. Even the term “Obamacare” was created as a derisive term by Republicans and only embraced years later by President Barack Obama. “Health care is different from almost every other federal policy issue, because it is so personal to people, and voters’ first filter for deciding whether a particular health care policy is good or bad is how they think it will affect them personally,” Garin said.